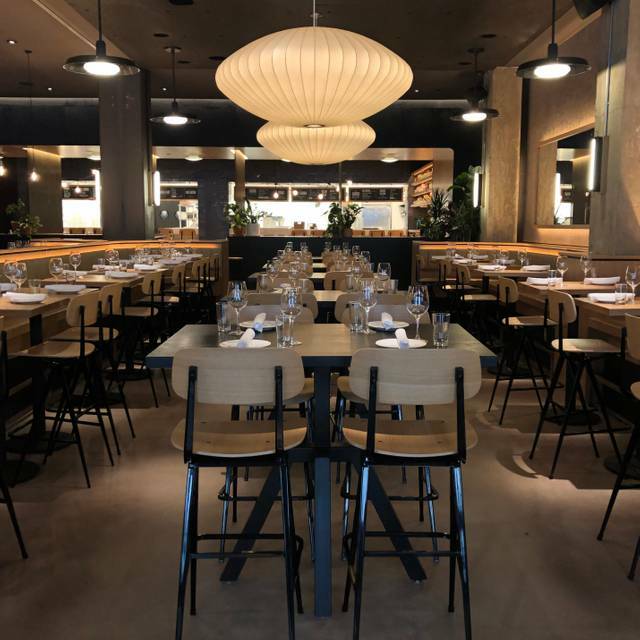 Boqueria provides a warm and contemporary space with airy, 12’ ceilings, floor-to-ceiling French doors opening onto bistro-style sidewalk seating, and a dramatic, four-sided bar with a glowing white oak and reeded glass display illuminating carefully curated spirits. There are multiple dining areas, each with their own unique function and vibe, are suitable for semi-private functions. The main dining room is framed by honeyed oak tufted banquettes surrounding central high-top communal tables. A set of steps carries guests up to an additional seating area adjacent to the lively open kitchen, with cozy booths and a 12-seat chef’s counter where guests have a perfect view of the chefs in action. Guests looking for a more intimate celebration have the option of using Boqueria’s private dining room, designed to seat up to 18 guests. The enclosed white oak clad room features a custom oak dining table, statement lighting & seamlessly integrated technology including a concealed flat screen TV. Lively, Barcelona-style tapas bar serving a menu of Spanish classics and market-driven seasonal specials in a warm, modern space in the heart of Washington DC’s Penn Quarter neighborhood. Very nice place overall. Brand new and beautiful on the inside. Service was amazing! The only issue was the food. “Patatas Bravas” were the burnt little bits of potato mostly. Sangria could have used a LOT less ice and a lot more fruit. I was very happy overall with lunch at Boqueria. The one knock against it was that the service was a bit slow although the restaurant wasn't very full. Our food was great, everyone was friendly and the atmosphere/décor is appealing. Would recommend going. Fantastic food. The waiter was very knowledgeable and attentive. Service was un-rushed. For family with children, you need to know that there is no high chairs, however. The have something for smaller toddler. Overall, I do highly recommend this restaurant. We went for Easter Sunday brunch and we were a table of 8. We had the bottomless brunch. Food was good- most things came out lukewarm, but with Tapas, it is ok and doesn't deter much from the flavor- the dates were great- not hot but tasty- bacon was limp and not crispy around the dates but the flavor was good, the potatoes were the same, lukewarm but the flavor was good- the tomato toast did not require it to be hot so it was perfect the shaved ham and cheese on top was wonderful- the rest of the dishes were fine- nothing spectacular. I have been to the one on M St several times and it is fantastic- I'm sure because it was very busy for Easter that they were not up to their usual game. I think I'll stick with the one on M St.
Great service from Will our server. He made fantastic suggestions for alternatives. Venue and food were amazing. For a a Saturday night I was expecting it to be a bit more lively though...but great time was had by all and we will be back. From being greeted by a warm and friendly hostess to the exceptional service from Raul our server, and the delicious food... it could not have been any better. I’m definitely coming back and will tell friends and family about this amazing experience. This is a great place to go for the happy hour before a CAPS game or some other Capital Center Arena event. No. the dishes were uneven. papas braba overcooked. albondigas salty. gambas al ajillo average. the beef dish we ordered was very good. serving of eggplant dish very small but tasty. Excellent service even though we were a large group. Great food. The service and food were excellent. We had the tapas prix fixe lunch and, there were ample portions. I've eaten at the DuPont location and the 9th Street location is as good or better. Will definitely go back. My only complaint is the high-boy tables and wooden banquettes. They're uncomfortable for any length of time. There are some tables but they appear only to seat large groups. Since we were early, the waiter suggested we take a table. Kudos to the waiter. I got the potatoes and the lamb kebabs. The potatoes were excellent - crispy and full of flavor. The lamb was too chewy to eat and did not come out warm. The service was good and the atmosphere was nice...but maybe steer away from meat dishes? The food was very good. Servers wandered around with plates of food trying to find the right table. We kept getting interrupted as people tried to present us with the wrong dish of food. Certainly okay, but not impressive. Great service, friendly staff, nice atmosphere, but the food itself was a let down. A great birthday lunch choice. They remembered about my note via Opentable and put a sparkler in the dessert. I plan to go again soon!!! Absolutely delicious authentic tapas plates and sangria! Wish I could eat here every night! Perfect! The good was excellent. Our waiter was great but their was a disconnect between the kitchen and our order. Our last tapa was served substantially later than our others. The restaurant did a great job with customer service and gave the tapa to the table free of charge. I had poor service but good food at Boqueria. My waiter had a fake Spanish accent which I found rude because when I ordered, he didn’t understand a word I said. The menu had “beicon” which I’m assuming mean bacon. The Spanish terms for bacon are “bacon, lacón, and tocino”. After asking if the olives had pits, my waiter responded that “they had bones.” He took a very long time to get our order and charged us for food we did not order. The food, on the other hand, was amazing. We ordered the croquette platter, the truffle one was delicious. The bacon wrapped dates were also great but could have used some sort of creamy sauce to give it more flavor. Churros with Dulce de Leche. They will become a habit! Outstanding service. Delicious tapas lunch menu (chef sample)! Just awesome! If I moved to DC, I think I would have to come here every day for at least a month! Amazing food, amazing service, great vibe. 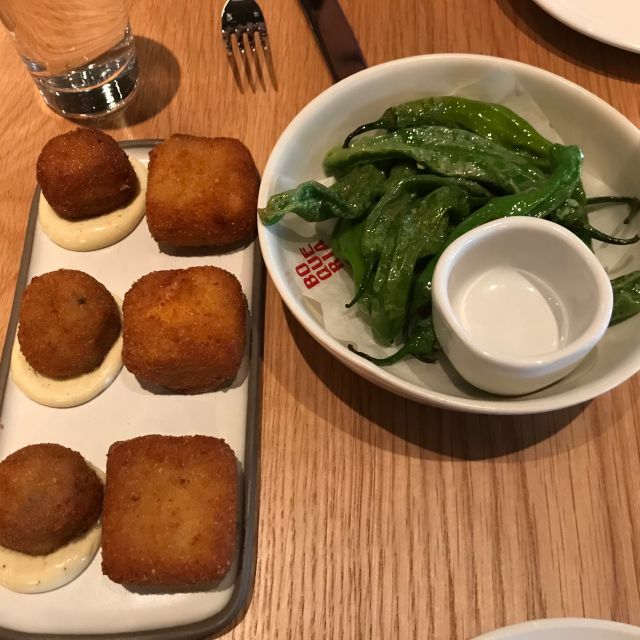 Feels like an authentic tapas place, but with a cool, hip New York-ish vibe, while still feeling casual and accessible for everyone. I'll definitely be back! Was talked into doing the tasting menu. Dishes arrived with little explanation, which was worrisome considering our food allergies. Food was good but the tasting was overpriced. Would have preferred to do individual dishes. Not impressed. Great food and ambiance. Small plates were a great chance to do tastings across our party of 6. Excellent food. Flavors were unique and layered but not too crazy. Prices were very good for this quality. Great addition to the neighborhood. We arrived at the wrong location but were graciously seated despite not having a reservation. The service was excellent, but we were less than impressed with the food. The Serrano ham, asparagus and stuffed dates were amazing. I wouldn’t order the croquettes or flat bread again. Great tapas food and experience. Sangrias were really nice. Great service and very tasty food both tapas and a bigger plate. Noisy, but that’s the case with every lively restaurant these days. Nice and interesting wine list. At lunch we were able to linger a long time. WOW WOW WOW! My first visit to Boqueria was to their Penn Quarter location and it was incredible! Very attentive service, food was out quick, sangria was delicious, and the food was so good! I will definitely be back! Maybe a coincidence, but I got ill during the night after my meal. Good food. Tasting menu had tons of courses. Service was very attentive. Incredible food prepared to perfection, impeccable waiter, very accommodating when asked about gluten-free dishes and drinks. The fennel salad was delightful. Lamb skewers and garlic shrimp, just wow! The ribeye steak was to die for; after a long day of walking, it was just what we needed. Can’t wait to return! Now my #1 choice in DC. We were a party of 4. Upon arrival, we were greeted right away. Although we had reservations, we opted to sit at the bar and enjoy the happy hour offerings. Rose, our bartender was fantastic. Very attentive and friendly. the food arrived quickly. 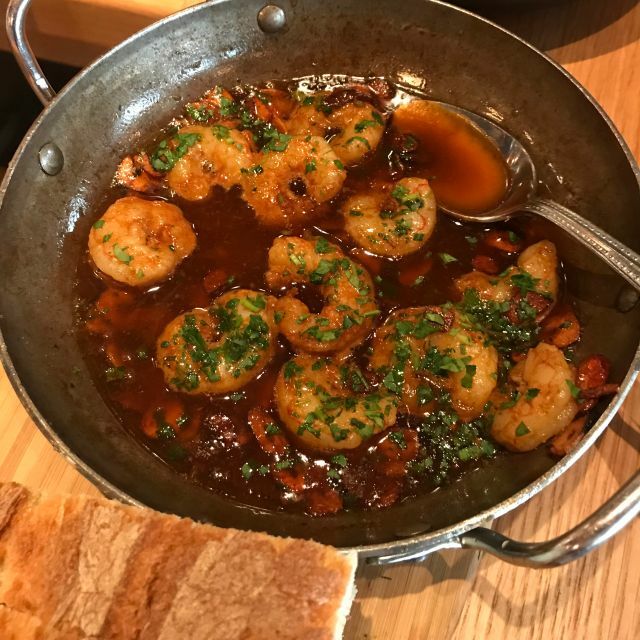 We had different tapas, and they were all delicious: pulpo (octopus), gambas (garlic shrimp), boquerones (anchovies), patatas bravas (spicy potatoes), and pan con tomate (bread rubbed with garlic and tomato). We'll certainly go back to this restaurant! A great addition to the neighborhood! The lunch menu at $25 is a great deal, and the food delicious. Perfect for a business lunch. Great restaurant. It was my wife's birthday and the staff made it very memorable. Great service from Carlos...and food was great too. Brussel sprouts and the lamb meatballs we're particularly yummy! The food is so delicious and unique that I’ll definitely keep coming back, the fact that you guys have an open kitchen makes it fun and the interior is very modern! Fantastic food and service. The staff was amazing, friendly, and eager to help. Great meal! Great food, great service, great atmosphere. Great ambiance for date night or dinner with friends. Service was great early in the meal but drifted a bit towards the end as the restaurant got busier. Interesting cocktails and good wine. The tapas were all terrific, tasting as good as they looked. The only real disappointment was the lack of a "signature" dish to put the chef's creativity on display. All fairly common tapas you can have elsewhere... but I'd rather they be less creative and delicious than creative and mediocre. I'd visit again.